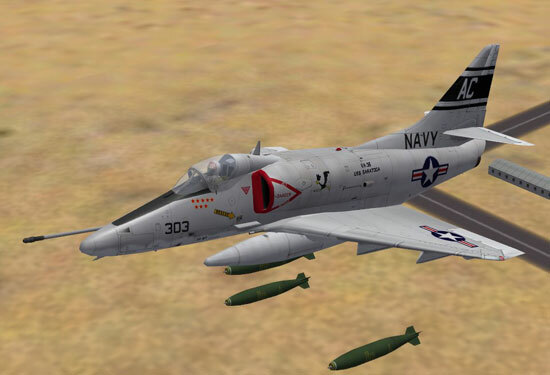 Beautifully rendered A-4 Skyhawk flying over the fictional desert terrain of Dhimar. Bombs away – unfortunately no ground explosions, etc. with the initial release. The first official release took place in October 2002, again under the auspices of Strategy First, and in retail stores such as EB Games for $39.99. What did you get for your 40 bucks? Nine beautifully rendered player flyable aircraft (A-4B, C, E; F-4B, D, E; F-100D and F-104G), and 12 AI only aircraft (An-12BP, B-57B, C-130A, IL-28, MiG-17F, MiG-19S, MiG-21F, MiG-21MF, MiG-21PFM, O-1E, Su-7BM and Tu22K). 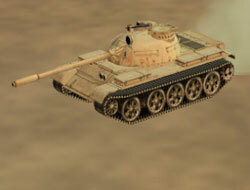 These flew over a reasonably textured desert terrain of the fictional nations of Dhimar and Pirani. 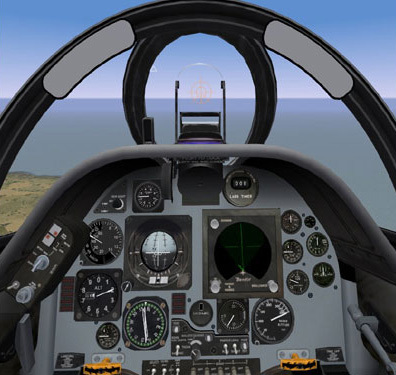 The office of the A-4. With Dhimar being a Client State of the West, and Pirani a Client State of the East, dozens of different objects from the arsenals of both Blocs littered the fictional terrain. T-54 and M-48 tanks, M-113’s and BTR-152 APC’s, Triple A and SAM’s aplenty, and plenty of objects to blow up (including the dreaded Comm Building!). 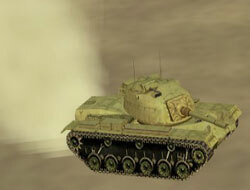 A T-54 and M-48, some of the ground objects in the initial release.